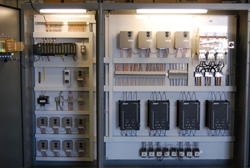 Pyro Industrial Systems Inc. has over 35 years experience in making custom Control Panels. Our custom built Control Panels can be built for any device, any product and fit for any project. Pyro Industrial Control Panels are built of the highest quality components in the industry using only the best in quality materials to make our products last a lifetime. If you can't find a Control Panel of your choice please be sure to either contact us or fill out a request form.